Seldom do I receive an offer to review a book; this was certainly a title I couldn’t resist accepting. 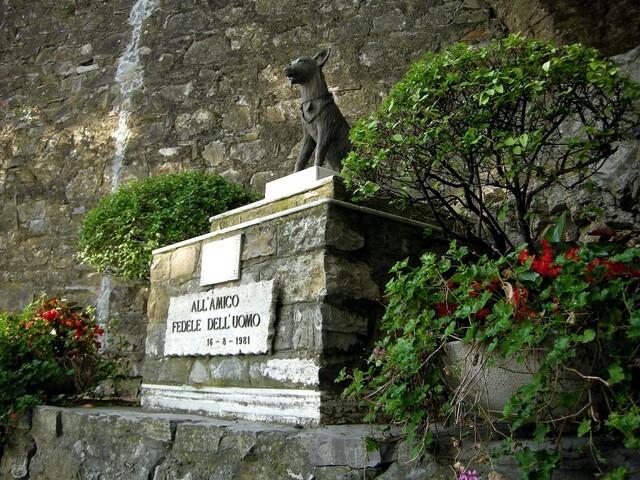 If you love Italy, dogs or both, you won’t want to resist reading it yourself. Justine van der Leun is a young woman who knows what she wants, whether it’s walking on two feet or four. Sometimes when she gets what she wants it turns out that she doesn’t want it after all (handsome Italian lover, horse), but sometimes when she gets what she wants it turns out to be life-altering (Marcus). 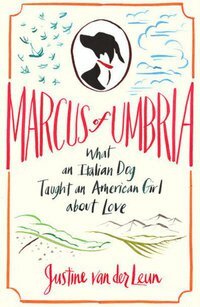 Justine moves to Italy to live with a man she’s known all of three weeks in the small Umbrian town of Collelungo, population hovering around 200. There she quickly learns that she has not taken on just the man, but his entire family as well, and they have taken her on, too. Without a strong extended family background of her own, the realities of an Italian family are a shock to our heroine, and one to which she can never entirely adapt. (There’s a lot here about the strength of the matriarch in the Italian family.) Also shocking is for Justine to see Italy as it really is, not as we imagine it from movies and other move-to-Italian-paradise books. Justine may have come to Italy, but it was no paradise. She remains in Collelungo a year, during which time she adopts a darling but challenging canine whom she christens Marcus. 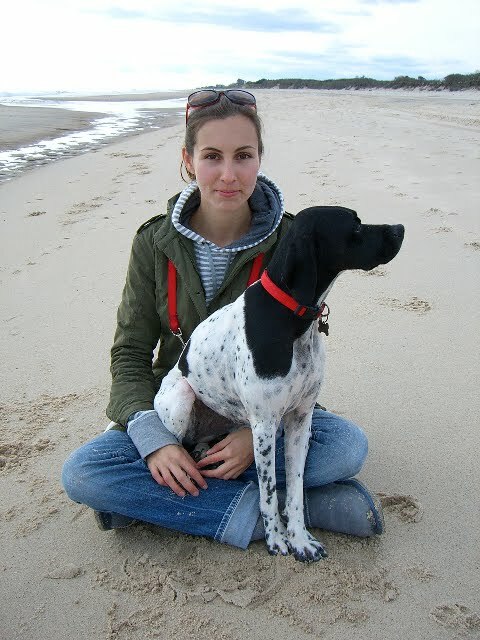 (You’ll learn quite a bit about the rather unfortunate circumstances of Italy’s hunting dogs.) Despite the doggy title, Justine ends up learning a terrific amount, not just about love but about life, from the family and from the town. Even more, she learns to know herself a lot better. That journey is the heart of book, and it is a delight. Strong-willed, intelligent and, perhaps, a bit privileged and naive, Justine is thrown into a situation where people still kill their own food, where self-sufficiency is a way of life and a point of honor. She has the grit , humor and humility to absorb the lessons that are offered by the experience. She’s a modern, witty young woman, and she’s a terrific writer. What I enjoyed most about the book is that it shows Italy as it truly is in a great many places. She lived in the ‘real’ Italy, not the Italy of the touristic centers of Venice, Rome, Florence, not the Italy of ‘Chiantishire’ in Tuscany, or the sun-drenched Riviera. People in Collelungo are patient, they are sometimes slow, they work incredibly hard, they probably know how to hold a grudge. Because they live in a town of only 200, there is nothing they do not know about their neighbors, whom they are very likely to accept just as they are, and they have no secrets of their own. They are not sophisticated, traveled, particularly well-schooled (though some of the young now are); they remember what it was like to be impoverished. But they know how to laugh, cook, eat, fight, and laugh some more. As Justine says, they have tailored their expectations to what they have; they are happy. And what about Marcus? She (yes, she) is the agent of Justine’s greatest lesson: responsibility for our actions. As she herself says, “I had willfully shifted another being’s course, and that meant that I was technically morally bounded to ensure her well-being for a lifetime”. That doesn’t stop her from making a few more blunders, but one of the most refreshing aspects of this book is the humor with which Justine is able to admit her own shortcomings. No, she’s not perfect; and neither is Italy or Umbria or her boyfriend and his family, or Marcus (bit of a chicken issue there). But they all have something wonderful to offer and Justine is smart enough to take it all in. Her boyfriend’s family, the Crucianis, are as warmly and honestly drawn as is Italy. And always there’s the sense of humor. There’s nothing pretentious about Justine van der Leun or her book. I don’t know her, but having read the book I feel like she’s a friend. I think you’ll like her too. San Rocco di Camogli is a lovely frazione high on the hill overlooking its mother town. The Saint for whom it is named is, rather alarmingly, the patron saint of contagious diseases. He lived in the 1300’s and helped plague victims during his travels from his native France through Italy. At one time he himself contracted the plague, and was saved in part by a dear dog who brought him crusts of bread in a cave where he’d taken shelter. 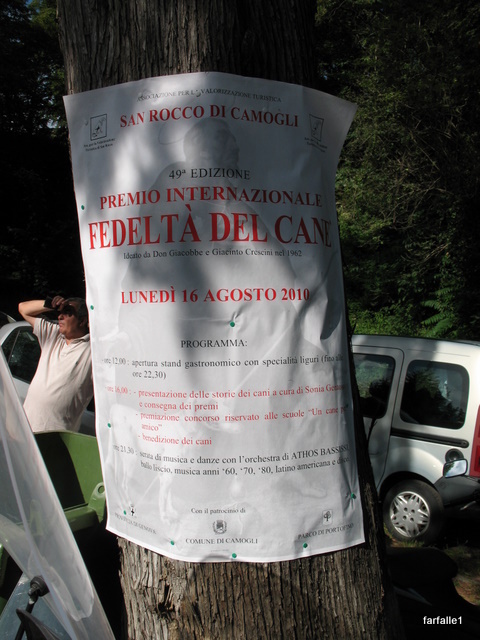 San Rocco’s day is August 16, and for 49 years now the eponymous town has given prizes to reward acts of bravery and courage by our four-footed friends, and to bless the species. As you can see from the photo above, it is exhausting! But if you are a dog-lover it is a wonderful event to attend. This year the weather smiled on the many dogs and even more people who came to meet the prize-winners and receive a blessing for the year ahead. Sonia Gentoso was an excellent Mistress of Ceremonies; without leaving out any important information she managed to keep things moving in as orderly a fashion as possible, given the number of dogs present. 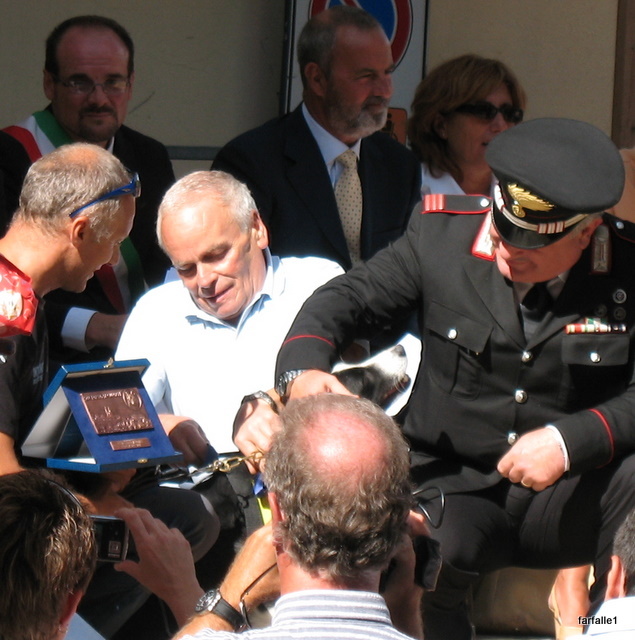 There were a number of important people on the dais for the ceremony, one in an impressive uniform and one with a very handsome ribbon across his chest (probably the sindaco – mayor – but I’m not sure). Antares. Antares was not present to receive her prize, although one of the women in her story was there to accept it for her. Antares usually spends her mornings with her ‘Nona’ while her mistress is at work. She goes to the second floor and barks outside Nona’s door until she is let in. One day a neighbor, familiar with this practice, heard Antares barking in the middle of the morning. Strange, she thought – why is the dog barking now? So she called the Nona and found that she was very ill from a hemorrhage. The neighbor called the ambulance, and thanks to the early notice of trouble from Antares, the Nona did not suffer long-term consequences. 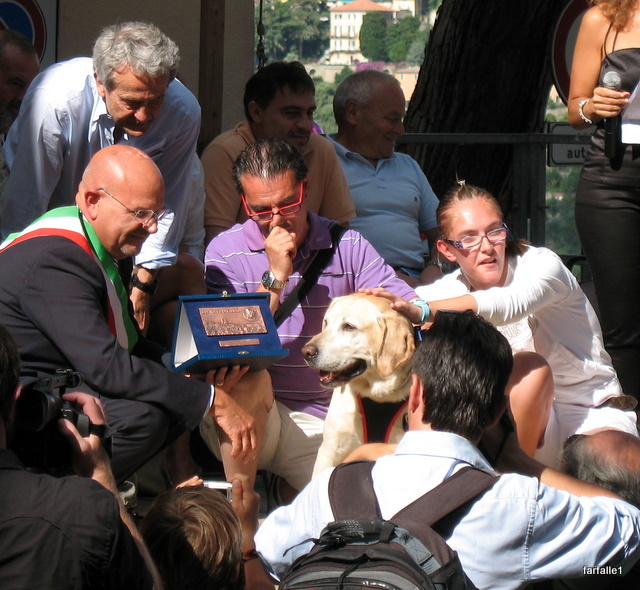 Bimba saved her family in Genova from a fire. Awakened in the garage where she sleeps by the smell of smoke, she made her way to the upstairs of the house and barked and scratched on the door until her master awoke and was able to get his wife and 4-year old daughter safely out of the house. But poor Bimba! She was pregnant at the time, and because of the stress she gave birth later that night to a dead puppy. The vet was able to safely deliver her of two healthy pups soon afterwards though, so the story has a happy ending for all. 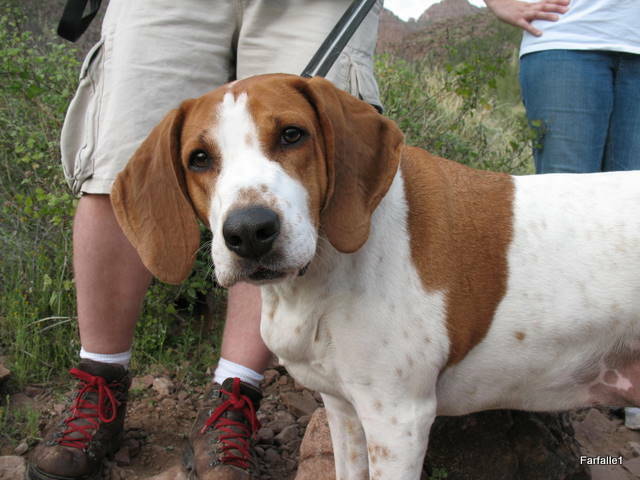 Cody works with the Scuola Provinciale Cani da Ricerca di Trento and is an ace at finding people who have gone missing. She did some very unhappy work in Abruzzo after the terrible earthquake. She won her prize for an event with a happier outcome: an old gent wandered off from the rest home where he lives and was missing overnight. Cody found him in the woods the next day. Thanks to her, he did not come to any great harm. 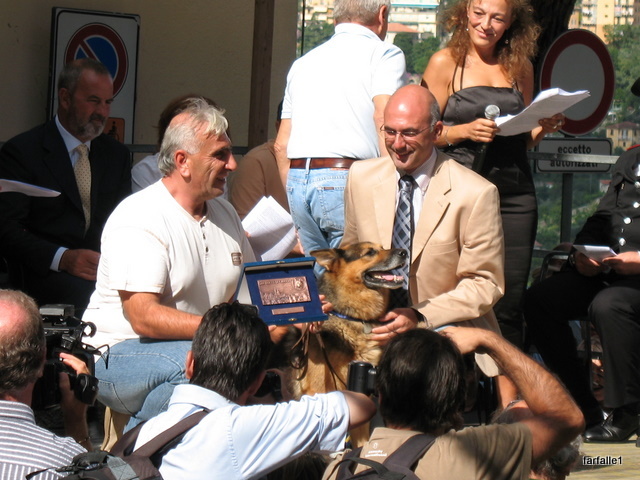 Clever Fado works with the Polizia di Stato in Genova as a drug-sniffer. He recently found 5 kilograms of cocaine. You’ll have to look hard to find Ioda, but she’s there. She won her prize for dragging her master away from the path where they were walking in Monza moments before a huge plane tree fell right where he had been standing. Because of her, he suffered only some minor cuts instead of being completely crushed. Lily. Alas, my photo of Lily did not come out, a pity. Lily is a 2-year old border collie from Belluno. Lily works with her master, a volunteer of Soccorso Alpino di Agordo. A Polish skier was caught in an avalanche and buried under a half-meter of snow for 35 minutes. Lily found the skier and he was rescued, not long before his supply of air would have run out. Rocky made an incredible journey. 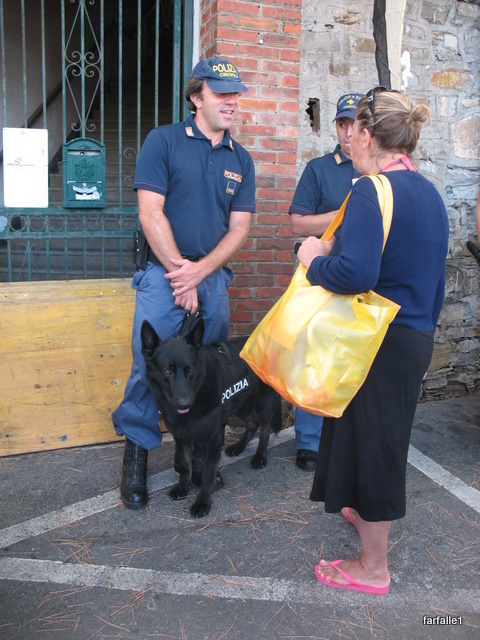 He was abducted from the beach while his master was bathing near Carrara three years ago. Eventually he ended up in Salerno where he was abandoned by the nomads who had stolen him, and adopted by a kind family there. But he kept running away, always heading north. Eventually he left them a final time and made his way to Pisa, where a woman found him. His collar gave the number of the family in Salerno and she called them. They said, he is a lovely dog and we love him but he has never adapted to living with us, you keep him. So she took him to a vet, who found the tattoo identifying his original owner. They were reunited after 3 years. It took Rocky 2 months to travel the 625 kilometers from Salerno to Pisa. 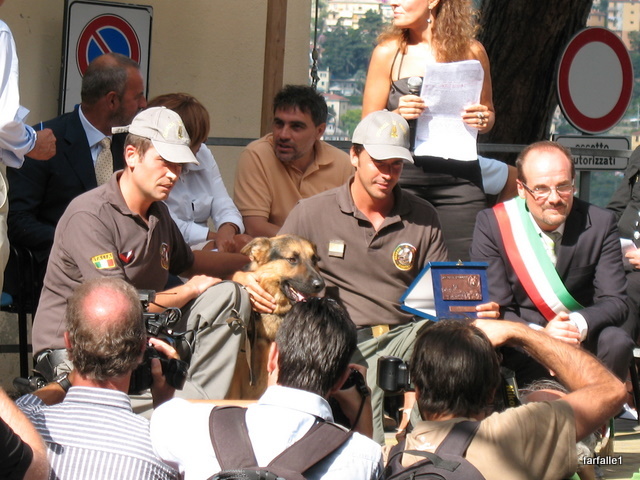 Talon works with the Guardia di Finanza in Genova and is another drug-sniffer. He recently discovered 7 kilograms of marajuana and 3.5 kilograms of cocaine. 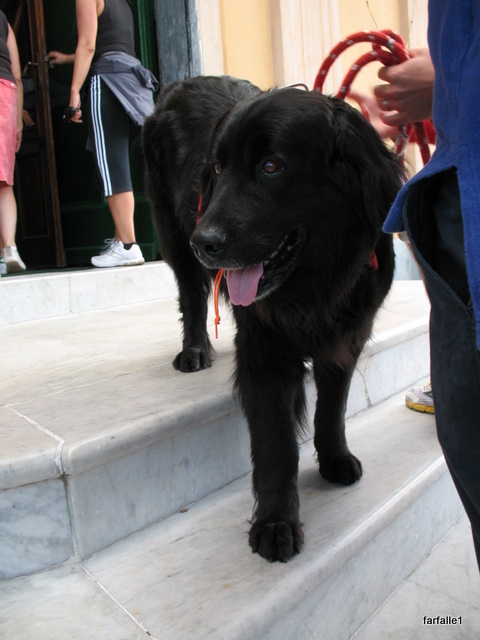 Zoe, a 7 year-old Newfoundland, saved three swimmers near Pisa. Two women were swimming with the 11-month old child of one of them when they were carried away by the swift current. They shouted for help, and were some 80 meters from the shore when the life-savers and Zoe reached them and brought them to safety. Pongo was walking with her master near their home in Settimo Milanese when they heard the cries of a 67-year old man who had slipped on the edge of a canal and fallen several meters into the water and mud below. Though the water was not deep (40 cm – a bit more than 3 feet) the man was too stunned to extricate himself from the mud, and could only moan for help as he commenced drowning. 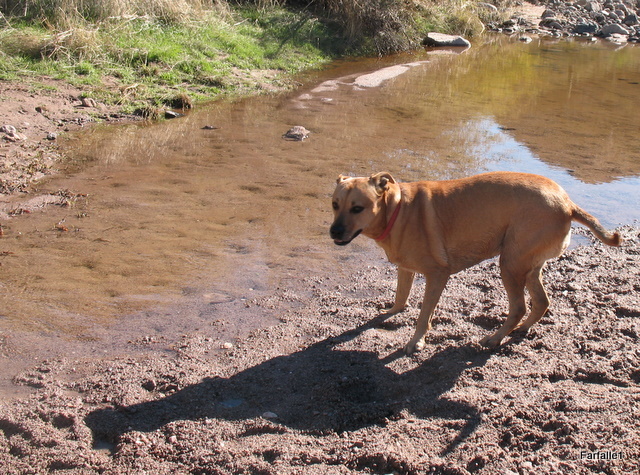 Pongo’s insistance on dragging his master to the edge of the canal undoubtedly saved the life of the poor man below. There was the 4th Annual edition of an art contest for young people in conjunction with the event. 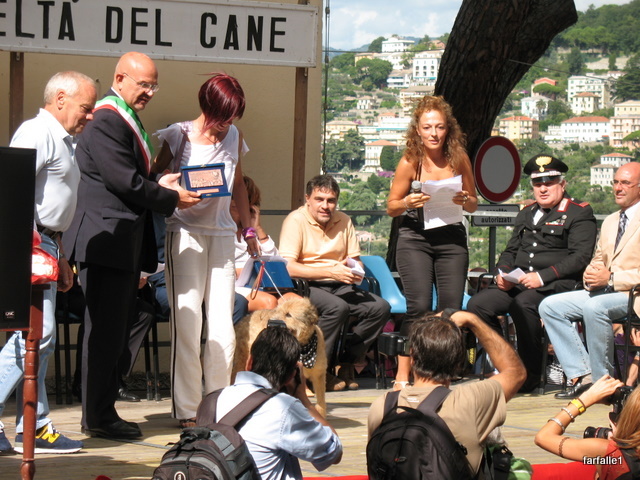 This year’s theme was -Un Cane per un Amico – a dog for a friend. The art was charming, of course. If you’d like to see some more photos of the event, click here for a web album. As usual I recommend a slide show. A dog’s life in Italy can be pretty comfortable; Italians dote on and respect their dogs, although they do not always train them well, and they almost never castrate or neuter them. In America if you are a mixed breed dog, you are a mutt; in Italy, you are a ‘fantasia.’ I know which one I’d rather be! You’re probably sick and tired of hearing me talk about how big everything is in the U.S. compared to Italy. Well, it’s not just houses, cars and people. 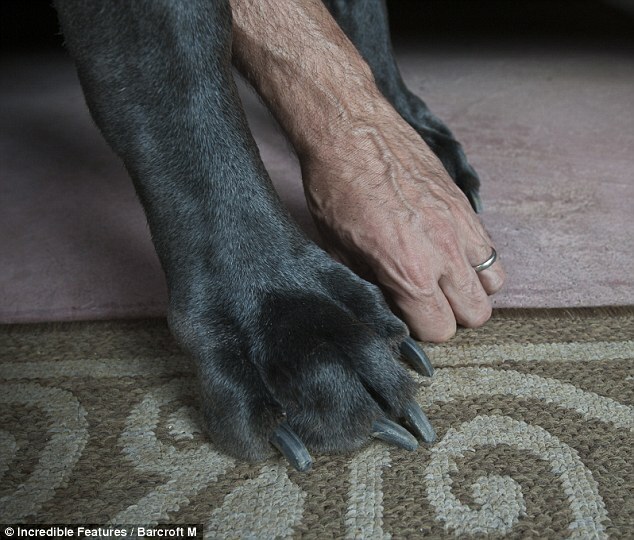 Meet George, a four-year old blue Great Dane with aspirations to become the Guinness Book of World Records title holder for World’s Tallest Dog. I think he’s got a good chance. He’s even from Arizona! 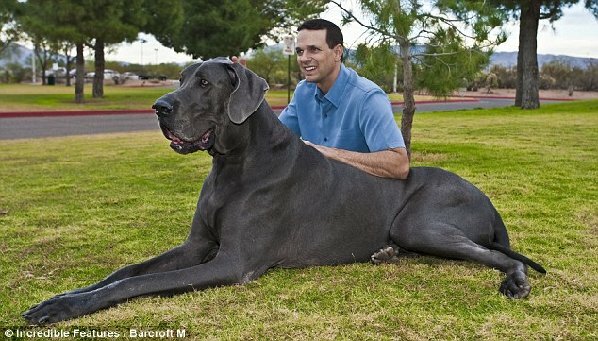 George and Diane Nasser from Tucson knew that their 7-week-old Great Dane puppy would grow up to be a big dog, but according to news sources, they had No Idea just how big he would become. 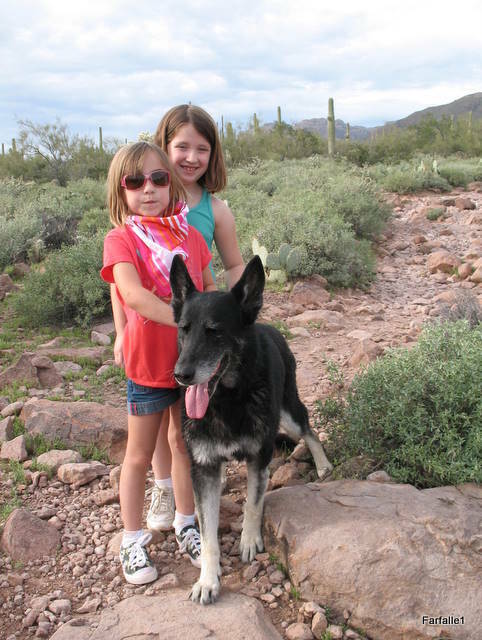 Here are a few of his stats: 7’3″ long from nose to tail tip; 42.625″ tall at the shoulder; weight 245 pounds. That’s a lotta pooch, with an appetite to match. George eats 110 pounds of dog food every month. You can learn more about this enormous canine here. The U.S.A.: Home of the Brave? Maybe – I hope so! – but definitely Home of the Big.